An Egyptian cleric allegedly kidnapped by CIA agents off the streets of an Italian city and taken to Egypt said Thursday he was tortured in an Egyptian prison and that he wants to return to Italy. Osama Hassan Mustafa Nasr, known as Abu Omar, made his first public appearance since he was released from Egyptian custody last week. His torture allegations could fuel the controversy over the first criminal case involving the CIA's extraordinary rendition program, in which U.S. authorities secretly transferred terror suspects for interrogation to third countries where critics say they faced torture. "I was subjected to the worst kind of torture in Egyptian prisons. I have scars of torture all over my body," Nasr told journalists after he made a surprise appearance at the trial of an Egyptian blogger accused of insulting Islam. The blogger was convicted and sentenced to four years in prison by an Egyptian court. Abdel Kareem Nabil received three years in prison for insulting Islam and one year for insulting Egyptian President Hosni Mubarak. He expressed fears that Egyptian security services would arrest him for speaking out. "I could be arrested the moment I leave here," he said at the court in the Mediterranean coastal city of Alexandria. "I don't want trouble with anyone any more. My body cannot bear any more prison and torture," he said. Italian prosecutors say Nasr was kidnapped from the streets of Milan in February 2003 by CIA agents with help from Italian agents. Last week, Italy indicted 25 American CIA agents and a U.S. Air Force lieutenant colonel, along with five Italian agents, for the alleged kidnapping. 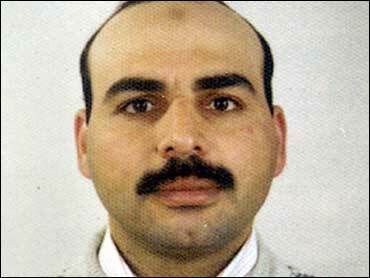 After his abduction, Nasr was allegedly taken to Aviano Air Base near Venice, Ramstein Air Base in southern Germany, and then to Egypt for interrogation. He was held for four years, until he was freed by an Egyptian court that ruled his detention was "unfounded." According to Italian officials, the cleric fought in Afghanistan and Bosnia and was suspected of recruiting fighters for radical Islamic causes. But Nasr's Egyptian lawyer Montasser al-Zayat has said Nasr had only traveled to Jordan, Yemen, Albania and Germany before entering Italy illegally in 1997. A prosecutor in Milan, Guido Salvini, issued an arrest warrant for him in April 2005 as part of a terrorism investigation. In Alexandria on Thursday, Nasr said he was innocent and wanted to return to Italy, where he was granted political asylum in 2001. "I appeal to the Italians not to give up on me in the predicament I'm going through," he said. "I want to go back to Italy, but I'm banned from leaving Egypt. I want to go back and stand in front of the Italian judiciary and prove my innocence." The Italian government has signaled it will not press Washington for the extradition of the 26 Americans for trial in Nasr's kidnapping, despite demands by the Milan prosecutors. The government is trying to avoid further souring Italian-US relations over the case. The Americans have all left Italy, and it is unlikely the United States would turn them over for prosecution even if Italy sought extradition. Egyptian officials never publicly acknowledged Nasr's abduction or his detention in Egypt. They also have not publicly confirmed his country took part in renditions. But Egypt's Prime Minister Ahmed Nazif told NBC's "Meet the Press" in 2005 that "people have been sent" to Egypt but would not say how many or discuss their cases.